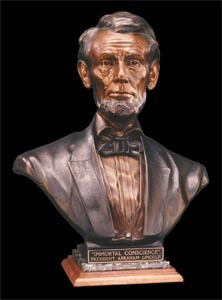 Original Abraham Lincoln Art, Sculpture, Prints, Masks and more. Affordable limited edition art for the collector. Suitable for the home or office, or for use as a presentation award. All sculpture made in America. art in sculpture, print, and paintings. PayPal. If you are paying with a credit or debit card you do not need to be a member nor do you need to become a member of PayPal to make a purchase. PayPal you may do so either before or after the transaction. Personal Checks and Money Orders by Mail, or COD UPS. At any time up to thirty days after delivery in the USA, you may for any reason, return the purchase in good condition, and your entire purchase price will be cheerfully and promptly refunded. If you would like to purchase any of our products, inquire about a private portrait commission, or have any questions or comments please contact the artist by using the email address Jimnance4617@aol.com or our phone number. Since Jim Nance travels frequently for portrait commissions, the quickest contact method would be email.